Photo: Go slow… Head teacher Tony McCoy (left) with staff and parents, Sherdley Primary juniors including members of the Road Safety Team (fore) and Merseyside Police. Pupils and staff at Sherdley Primary School have been making known their feelings about road safety. 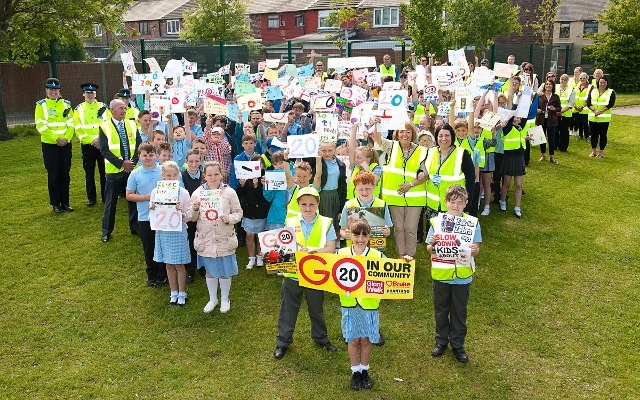 Embarking on a campaign walk, supported by Brake, the road safety charity, the junior pupils canvassed the surrounding streets with road safety messages, created during art lessons, urging motorists to heed the 20mph advisory limit along Mill Lane and avoid potential accidents. Young campaigners were prepped for the Brake Great Walk by the school’s own Road Safety Team of junior pupils, who gave a special assembly about safe speed limits, stopping distances and general road safety. Slogans included: “twenty is plenty” and “slowing down saves fuel and lives”, among others. Head teacher, Tony McCoy said: “There are two sides to road safety. The first is ensuring our children and young people know how to be safe on and near roads, but with that, we need to make sure that motorists and other road users, the vast majority of which are responsible drivers, are driving carefully near the school. ← The Cheshire Police and Crime Panel want you to have your say!